Linda's Gourmet Latkes was established in 2004 when Linda Hausberg realized that it was time to share her delicious mouth-watering latkes with the world. It didn't take long for people to realize that even if they didn't have the time or energy to create their own latkes, they could still enjoy homemade latkes that were equally "as good as Bubbie used to make." 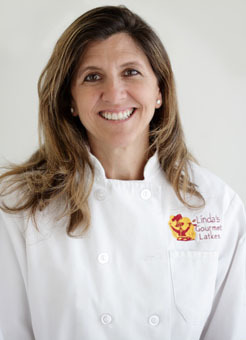 Linda Hausberg, the founder of Linda's Gourmet Latkes, grew up in Montreal, Canada and attended college at the University of Toronto where she studied commerce and finance. Linda has always enjoyed cooking and has shared her delicious treats with many friends and families over the years. Her home has always been the place to celebrate many holidays and celebrations. When Linda’s daughters grew older she decided to venture out into the work force with her delicious frozen latkes. Linda began selling her latkes to friends and families at local Holiday Boutiques and still goes back to the boutiques yearly to visit and get inspired by her loyal customers who sometimes come to the boutiques just for her products. Linda’s team has been with her since the inception and has seen this very small business’ grass roots beginnings blossom into a nationwide company. Linda loves to see someone smile and nod when they take their first bite of her latkes- it makes it all worthwhile. Linda's Gourmet Latkes are now available at fine food stores in Los Angeles and many other Specialty Food Stores throughout the nation- the consensus is clear...they are YUMMY!! And, Linda looks forward to bringing you many new products in the months ahead. 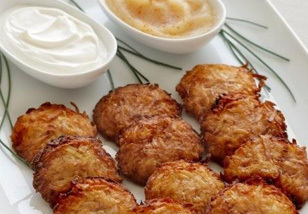 Did you know that latkes were originally made with cheese? Legend has it that in the 16th century, a young widow, Judith, fed the Assyrian general Holofernes salty cheese latkes so he would thirst for more wine and become intoxicated. It worked and she beheaded him in his stupor, which allowed the Jews to defeat the leaderless Assyrians. It wasn't until the mid-19th century when potatoes began to be farmed that latkes were made from potatoes. However, the most important element is the oil that is used to fry the latkes, which symbolizes the holiday miracle in which one day's worth of oil illuminated the Holy Temple for eight days when the Jews recaptured it in Jerusalem in 165 B.C. 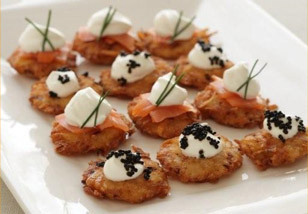 "Latke" is the Jewish name for potato pancake and other cultures and countries have their own versions of this traditional favorite. Latkes are crispy classics that have not only stood the test of time but have become popular year round in different flavors and sizes. Maybe the latke is becoming the new bagel? !